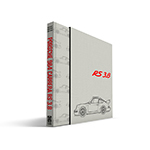 This comprehensive book shows the history of the Porsche 964 Carrera RS 3.8 and RSR 3.8 in detail. The new Group C regulations, which changed the motorsport world from 1982, inevitably had an impact on the importance of the Porsche 911 in racing. Although a race car based on the 911 could still be seen on all race tracks with the Porsche 935 in the hands of private teams and could still celebrate successes at the end of the 1980s, Porsche had put everything on the new 956 and later 962 sports cars from the factory side. 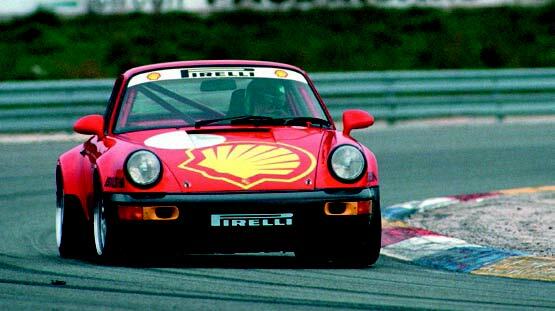 The Porsche 911 received little attention from the factory in terms of racing and customer sport. "Win on sunday - sell on monday" - Following this strategy, the volume model Porsche 911 was again the focus of motorsport enthusiasts. For this purpose Porsche, after good experiences with the Porsche 944 Cup, had also created a one-make cup for the Type 964 - the Porsche Cup. Private teams competed for the championship with a small series of so-called "Cup cars", weight-reduced, slightly performance-enhanced and equipped with racing safety devices. The most important prerequisites for remaining cost-effective were proximity to series production and the use of identical vehicles for all teams. To prevent tampering, the engines were sealed and the engine control units were drawn before each race. Based on the Carrera RS 3.6, which was launched in 1992, the Carrera Cup concept was further developed in the form of the 964 N-GT. For America, a super car series, which was to follow the same principles, was considered but never realized. The idea of building the Carrera RS 3.8 as a homologation model and the Carrera RSR 3.8 as a production-ready racing car was born in a fundamentally difficult phase for Porsche. The financial difficulties of the parent company due to a crisis in the global economy, management errors and far too high production costs created the worst possible conditions for cost-intensive activities in racing. As changes to the regulations in Group C (away from the consumption formula, Bernie Ecclestone changes the regulations to cost-intensive 3.5-litre), it was also decided to end the factory Group C commitment. The customer sports department in Weissach under the direction of Jürgen Barth was without a cost-covering task in one fell swoop. As project manager, Roland Kussmaul was instrumental in the development of the 964 Carrera RS 3.8 and 964 Carrera RSR 3.8. He was often in the wind tunnel with new components and body modifications and spent countless kilometres with the two test vehicles on the test track in Weissach and on public roads. 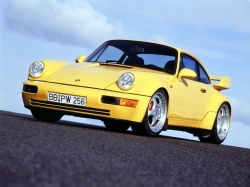 In Weissach, Roland Kussmaul used a pre-production Porsche 964 test car from model year 1990 (L series), which was still available in the development department, and built it into a pre-production RSR 3.8 - a first practical feasibility study and above all the test and advertising car for the coming years. 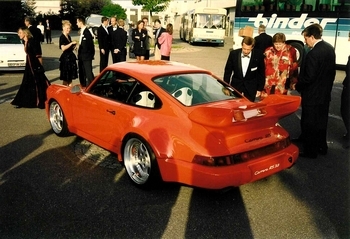 After the factory holidays in 1992, the Weissach customer sports department ordered a bodyshell from Porsche AG for the construction of a demonstration object for the street version to be produced in parallel as a homologation model. This car was ordered ex works with the option M491, i.e. in turbo-look with the body parts of the turbo. Porsche also offered this option for the Carrera 4 - as an anniversary model for the 30th birthday of the Porsche 911 - from model year 1993. 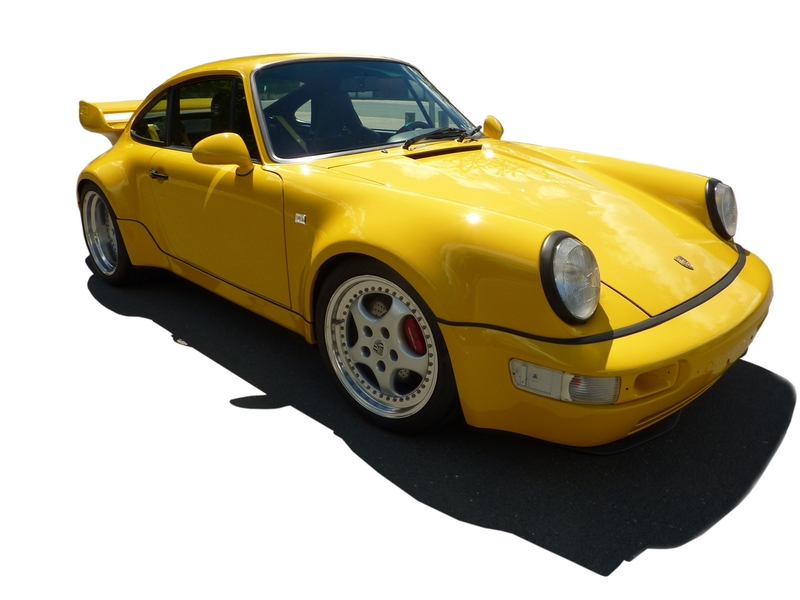 In fact, from a historical point of view, this pre-production car is the only really existing 964 Carrera 2 (964330) in the Turbo-Look factory, and it is certainly the world's best-known 911 Carrera RS 3.8, although strictly speaking it is not one. Pictures of him were included in the 1993 press release, have appeared countless times in trade journals and are now omnipresent on the Internet. 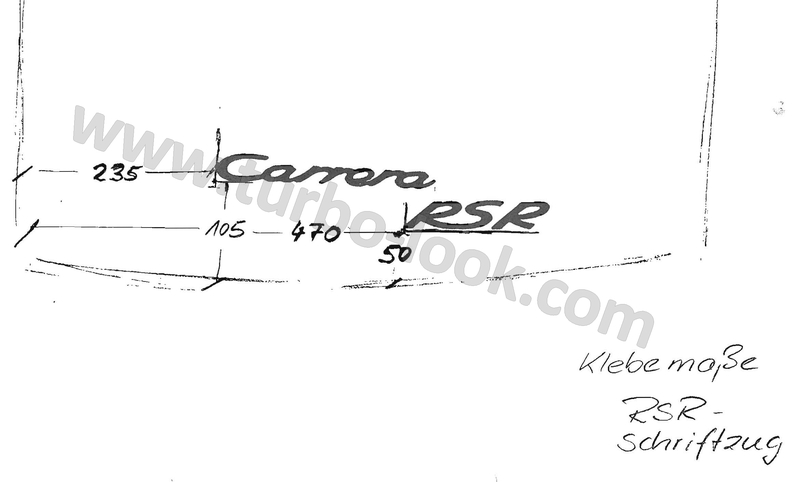 The Porsche press release and subsequently all car magazines and publications speak in connection with the Carrera RS 3.8 and the race car Carrera RSR 3.8 of a handmade small series. In fact, however, both vehicle variants were manufactured on the normal production line in the Porsche plant in parallel to series production. After the shell construction, the vehicles were taken to Matter, the necessary welding work of the safety cage was carried out, and then the series production was carried out again up to production point 6A. There, the largely finished cars were moved to Weissach, where remaining work, corrections and the installation of racing parts were carried out by hand. 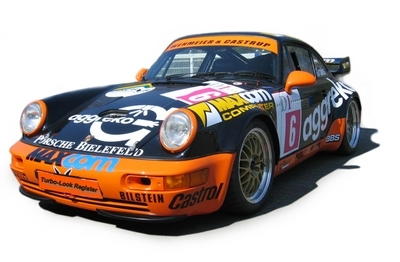 The first manufactured car is WP0ZZZZ96ZPS497062, the Tangerine Carrera RS 3.8, which was registered with the registration number BB - PW 274 on the press department of the Porsche plant. Until today, this car has never been registered to another owner again. 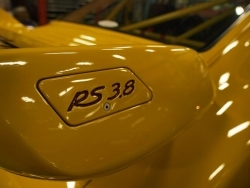 Optically, the series RS 3.8 corresponds to the top model of that time, the 964 Turbo 3.6. The PU front fairing was fitted with two small spoilers to provide downforce and two air inlets instead of the fog lamps in the bumper for more fresh air for the two oil coolers. - A second oil cooler was installed on the left side instead of the air-conditioning condenser. - A large, newly designed and homologated rear wing with six-way adjustable tail unit was integrated into the newly designed engine cover made of composite plastic. Hoods and doors were made of aluminium, the rear and side windows of thin glass. The interior was largely identical to that of the Carrera RS 3.6, with virtually all the comfort details and the rear seat system removed and the Recaro bucket seats fitted. 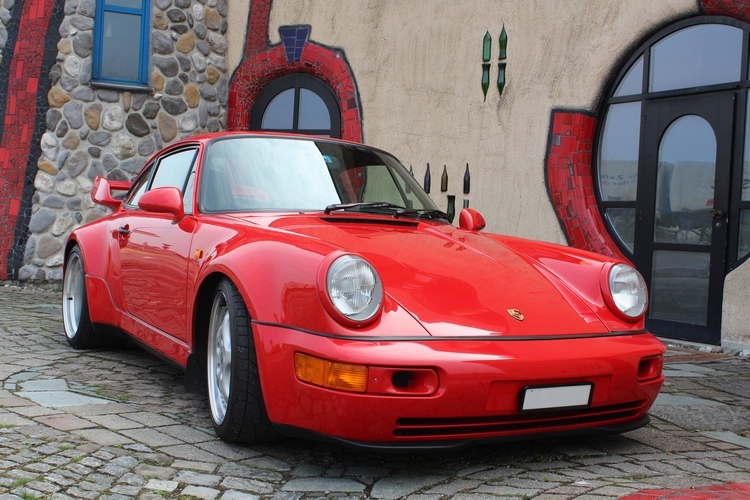 The 92 tank, which was always optional for the Porsche 964, was standard equipment on the RS 3.8. (except for all RS 3.8 configured for Japan, which have been fitted with the 77 litre tank for typing reasons.) 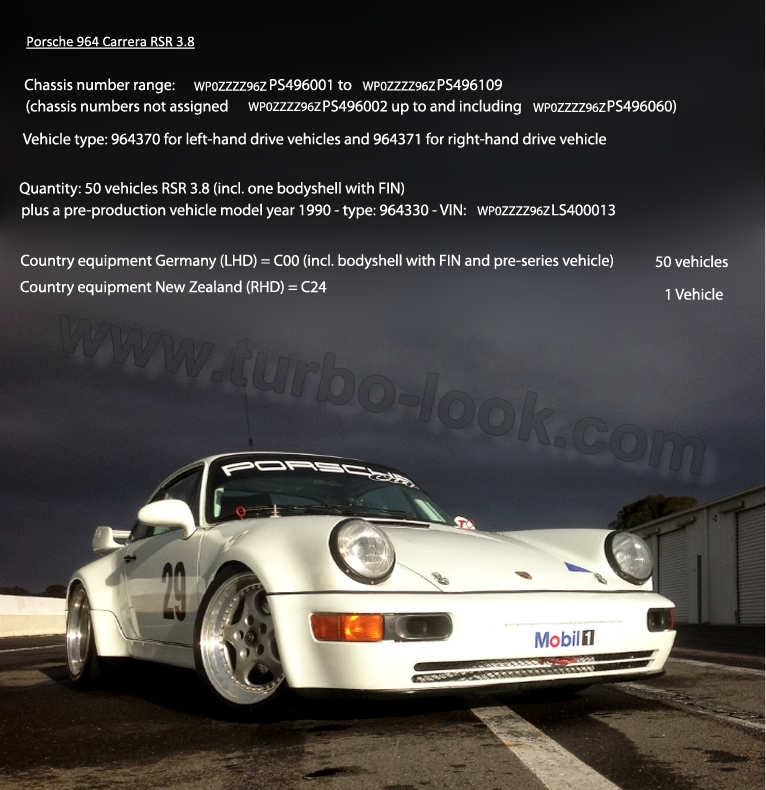 Nevertheless, the weight dropped by as much as 140 kilos compared to a conventional Carrera 2 to 1210 kilos. The RS 3.8 were delivered with Speedline wheels, front 9J x 18 ET 67 No. 965 362 138 00; weight 11 kg (tyres 235/40 ZR18), rear 11J x 18 ET 5 No. 965 362 142 00 (tyres 285/35 ZR 18) each with a rolling circumference of 645mm. The RSRs were fitted with a slightly wider Speedline wheel set: front 9.5J x 18 ET 57 No. 965 632 138 01 weight 11.2 kg (tyres 245/40 ZR18 from Pirelli or Dunlop), rear 11J x 18 ET 05 No. 965 362 142 01 weight 12.2 kg (tyres 305/35 ZR 18 from Pirelli or Dunlop). 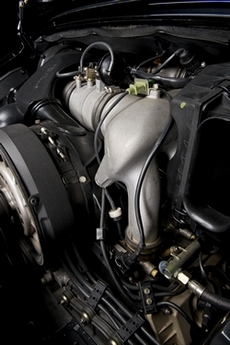 The engine was derived of the prototype from the new 993 engine and received an increase in displacement to 3.8 litres. Not only was the bore increased from 100 to 102 millimeters (with a constant stroke of 76.4 millimeters), the entire machine was actually fundamentally reworked. The pistons were bigger, but still lighter. The rocker arms were completely redesigned and manufactured using investment casting technology, which initially caused some problems. The engine was controlled by a Bosch Motronic Type 2.10, which also enabled adaptive knock control and optimized map identification. Here, too, later series production technology of the Porsche 993 was used. 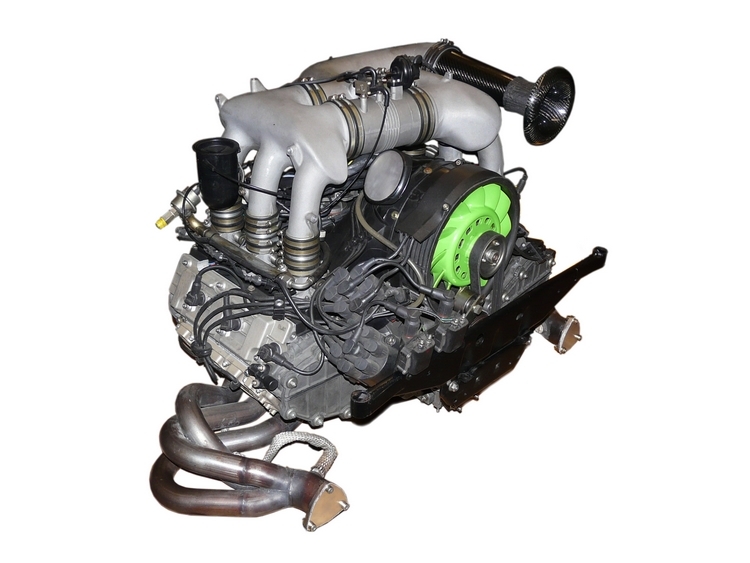 The air filter system installed in the gas flow and the intake system with six individual throttle valves extended in the ducts, together with sequential gasoline injection, created an excellent cylinder filling in all speed and load ranges. 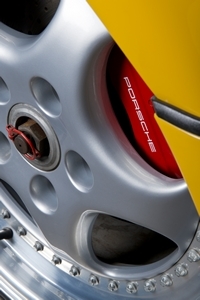 The exhaust system was completely redesigned and anticipated the design of the Porsche 993 exhaust system. The manual 5-speed transmission of the RS 3.8 corresponded to the Carrera RS 3.6, had the same transmission wheel set, a weight-optimized flywheel and a reinforced clutch. As a special feature, the G50.10 transmission had a 40/40 % differential lock. (as stated in the documentation - the gearbox numbers show a built-in 20-100 % differential lock). 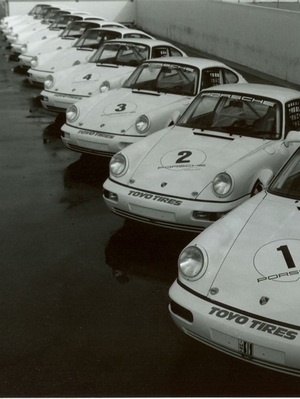 The RSR transmission was equipped with gear wheel pairs according to the optional Le Mans or ADAC Cup versions or delivered modified on customer request. Here the 40/40 % differential lock was obligatory. 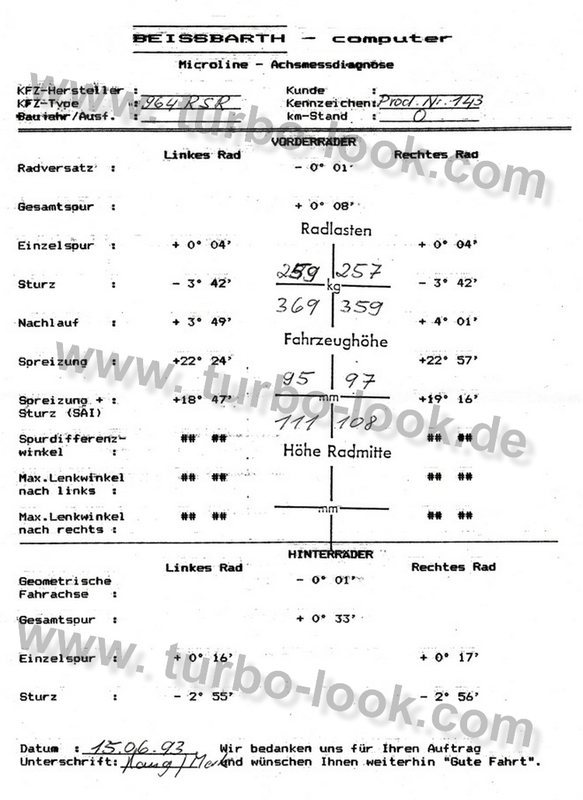 All these measures then produced 300 hp at 6500 rpm and a maximum torque of 360 Nm at 5250 rpm; the red range was 7100 rpm. So upgraded (and thanks to lower weight) the Porsche 911 Carrera RS 3.8 came up to 4.9 seconds for the sprint from 0 to 100 km/h and a top speed of 270 km/h. The racing version reached up to 350 hp at 6900 rpm due to a further modified stroke and a further modified intake system and engine control. 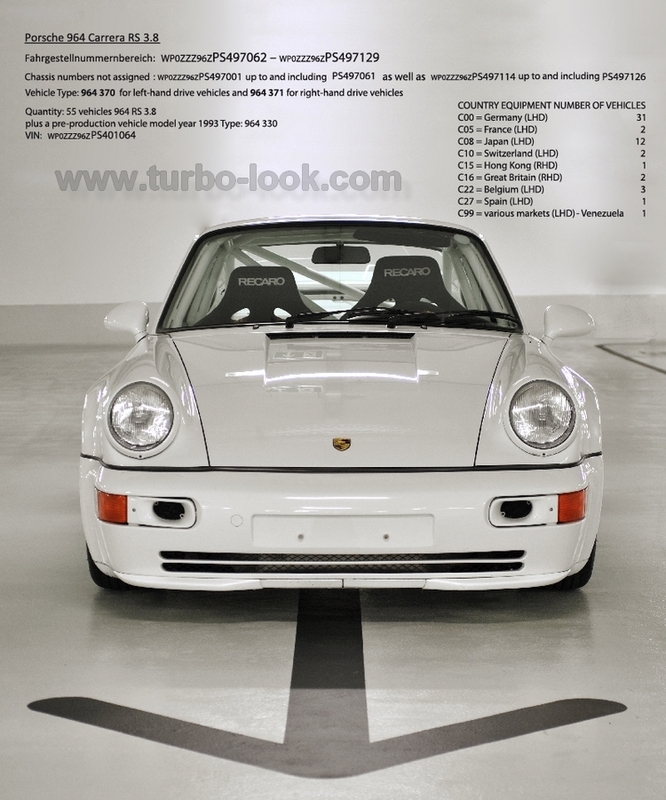 A small arc to the number of pieces problem around the Porsche 911 in general may be allowed, because at the example of the Porsche 964 RS 3.8 is the whole misery around the numbers well to illustrate. From the start of production, the plant received requests for quantities, colour distribution and exclusive details on a daily basis, regardless of the series. All answers to these questions have been archived and still serve as a reference for similar, constantly recurring requests. This is how the number of units came about from the factory side, which were often only partially correctly researched. Answers excluded from an often still running production simply do not fit one to one to an inquiry made a year later. If one considers that such documents form part of the basis of the known standard works on the subject of quantities, much becomes clearer. Often these inaccurate sources had to be sufficient, as more extensive material could and is no longer found. In fact, a comparison with the digital databases of Porsche AG never took place and has never been possible from a technical point of view. In the different standard works, which deal with piece numbers, and with the data of the work, the data of for example: 90 pieces at Marc Bongers as total piece number, to whose data probably also Wikipedia refers. 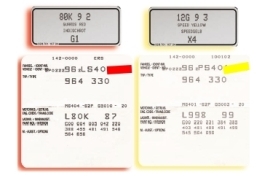 Adrian Streather even uses 129 RS and 130 RSR, here the range of reserved chassis numbers is used. 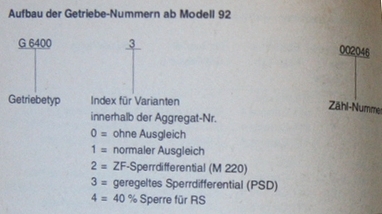 Paul Feré mentions a total of 100 copies, to which Barth/Büsing also refers, but this figure is still split into 55 RS and 45 RSR. There are contradictory data from the Porsche plant. At least for the RSRs, however, the number has also been fixed at 45. 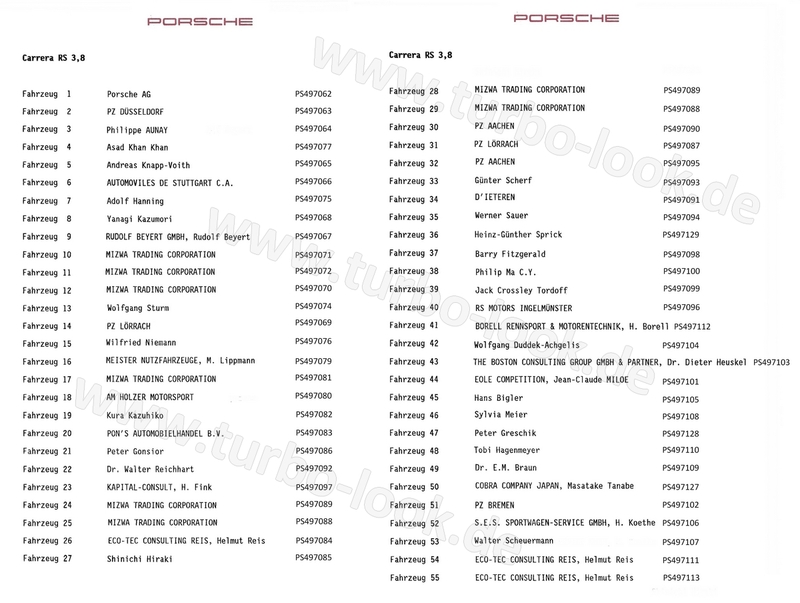 This is probably due to the fact that four regular RSR 3.8, as well as one bodyshell put into circulation, have obviously "been lost" in the official database of Porsche AG. A precarious fact, considering the value of these cars in private collections.